Hard work, much patience, a 21 hour airline flight, and Nebraska snow allowed 26-year-old Filipino native Mario Patalinjug, Jr. to fulfill two of his goals. He has now been a medical technologist at Boone County Health Center, Albion, for more than a year. 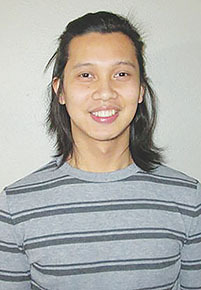 Qualifying for H-1B visas, which must be requested by the prospective employer, and then passing tests to practice medical technology here, plus an English test, allows Mario and his fellow Filipino laboratory coworker, Jake Tagle, to work in the laboratory of BCHC for a preset number of years. “To change the visa depends on the company we are working for. If they would love for us to remain here, they could sponsor us for a green card,” Mario explained. A green card allows them to apply for citizenship — a process that takes several years. “I’d been working for three years in the Philippines … when I decided I needed to have a better wage, so I searched some jobs on-line and asked people if they know some companies here that will provide work for me. It’s like a referral from a friend,” he said. Wages in the Philippines . . “is too little; you can’t give support to your family if you are the only wage earner,” Mario said. His father works for Cebu City government and his mother is a housewife, so Mario also helps out with their finances. “The main purpose I came here (for) is to save money and come back home and do some business,” he said. Mario and Jake arrived in Albion Dec. 28, 2017 after their long airplane flight with stops in Japan, Dallas, TX and Grand Island, where they were met and brought on to Albion. Jet lag lasted a week for him, he said. Mario and his brother, who is a physical therapist in New York, grew up in heavily populated Cebu City, which is three million people ‘strong,’ he said. He attended the Cebu Doctors University. “Our national language is Tagalog, … and my native language is Visaya,” Mario said. “… there are a lot of dialects’’ in the Philippines. “After church we go to the mall and spend the day there, because my dad likes the air conditioning at the mall. He just walks (exercises) there. We eat together … It’s a family bonding time,” he said. Read the complete story in the Jan. 23 issue of the Albion News print and e-edition.